When selecting a cycling jacket, you should consider the following aspects: warmth and dryness. The jacket you select for winter riding in Chicago will probably be different than the one you'd use for spring. Also take into consideration that you'll warm up from exertion during your ride. Cycling jackets that offer maximum warmth will protect you against the wind and offer insulation mostly in the front and arms. Riding in cold weather elements doesn’t have to be unpleasant if you have the right jacket or vest! Aero Tech Designs is proud to present our selection of riding jackets and vest to keep you riding longer and feeling stronger. We offer various weights of jackets from extremely cold weather riding to light weight, windproof jackets for cool spring mornings. We also offer various jackets to defend against the elements such as wind or rain. Having a great jacket that fits well and for the correct elements will make all year riding possible! When selecting a jacket or outer layer, there are many ways that’s riders select a jacket, but the rider should consider the temperature they will be riding and if moisture will be present as number one reasons to buy a riding jacket. A rider in the northeast Vermont during March would be looking for a different jacket compared to a rider in Portland during the same period. Another major element that jackets outer layers protect from is Wind. Besides the main benefits of wearing a jacket riding, warmth and dryness, there are features on each jacket to help protect you from the elements, keep you safe on the road, and to provide you with an ease of accessing your other gear and ridding supplies. Each jacket can come with one or two of these features while others can come with tons of great features. Depending on the riders needs, some features on the jacket are more important than others. Features include safety reflective, specialized pockets, heavy duty and windproof zippers, special fabrics and fabric treatments, attachable hoods, and many more! Pockets are very underrated when it comes to determining if a jacket will suit your needs a cyclist. If a rider is on longer rides and needs that extra storage for food or gear, then pockets are a necessity. If the cyclists are from a very wet location, then the jacket should have zippered pockets to protect the items inside. Zippered pockets also add security, so items don’t fall out. Pockets can be located on the sides of the jackets, on the front breast, on the lower back, and some even on the sleeves. Some jackets can have specialized pockets for Phones or other devices. The jacket layout and design can range depending on rider need. Some jackets have two parts that can be removed as the weather changes to warmer or colder, such as removable hoods or sleeves. Other jackets have on the fly adjustments built in for when the weather changes on the ride. These features can include a two-way zipper, Draw Cords, and adjustable cuffs. Some jackets come with breathable vents, primarily on rain jackets, to prevent the trapping of moisture. These can be located on the back or under the arms. Waterproof performance apparel keeps heavy rain from getting through to your skin, while also moving sweat back through to the surface. If you’re planning any activity that gets limbs and lungs pumping, this is your kind of gear because both precipitation and perspiration can soak you. Any waterproof jacket is also windproof. Water-resistant is also breathable, this is gear that can handle light rain for a brief time, like windbreakers and featherweight jackets, for example. Windproof layer protects the rider from gust of wind that would normally chill the body. Essentially the same as a water-resistant jacket, this is often an ultralight garment that easily stuffs into a pocket. Made for short trips and optimistic forecasts, it won’t offer much protection in a full-fledged storm. You will also find jackets with windproof technology, typically some type of laminate, that are only considered water-resistant. 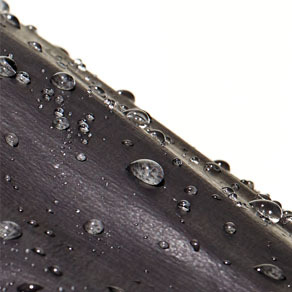 Durable water repellent (DWR) is an addition of a special water repellent finish to the outside of the fabric to shed water, prevent saturation, and keep water from sitting on top. DWRs do not inhibit breathability because they do not coat the fabric surface. Rather, they bond to the fibers and do not fill in the spaces between those fibers. When a jacket’s fabric is water repellent, this means that the water rolls off the garment, which isn’t the same as a fabric being water-resistant. Water-resistant is an overall assessment of its ability to prevent water penetration. Reflective elements on jackets provide safety to the rider. Most of the time when it is raining, visibility is lower for passing cars. Having highly reflective elements on a jacket gives motorists a heads-up on and keeps riders safer. All cycling jackets have a reflective element. As a cyclist who rides in all weather conditions, you will be battling the elements and it is very important to know how to layer your clothes to stay comfortable on the saddle to Ride Longer and Feel Stronger. If you properly layer your clothes your body will not waste energy trying to regulate your body temperature. There are three main levels in proper layering. Some are not necessary depending on the conditions and temperatures. The layering levels are, the base layer, which is underneath everything to keep control moisture, followed by the middle layer, which can be is normally used to insulate the body, and lately the outer layer to protect from the weather elements. Base Layer As mentioned above, the base layer main purpose is to control the moisture that is produces with vigorous exercise. Base layers are worn against the skin to move perspiration away from the skin to maintain a more consistent body temperature. Base layer fabric is normally a merino wool or synthetic fabric, such as a polyester CoolMax or Wickaway. A cotton t-shirt or garments should never be worn as a base layer because cotton absorbs moisture keeping it against the skin and making body temperatures range instead of keeping it consistent. Various levels of thickness, fabric types, and styles of base layers are available. Having a great base layer will make help make the jackets, vest, and other outer layers, perform better in tough conditions. Middle Layer The middle layer main purpose is to insulate the body by trapping heat in between the jacket and base layer. Middle layers can range depending on the weather conditions, the jacket or vest being worn, or how long of a ride. They come in various fabrics and styles with each offering benefits depending on need. The most popular fabric for a middle layer is a Classic Fleece fabric. This polyester thermal fabric provides warmth and is lightweight and breathable, even when wet. They dry faster and have a higher warmth to weight ratio than wool. Wool and Wind Fleece are other popular fabrics for a middle layer because of the warm and element protection that provide when matched with a jacket or vest. Other cyclists use standard jersey when the weather will be warming up during the day time. Outer Layers Outer layers have been described throughout this article, but they mainly include Jackets and Vests. Jackets can be uses for specific riding conditions, such as pouring rain, or they can be used for multiple conditions such a spring day that starts out cold and windy then turns to cool and sunny. Jackets and Vests come with tons of great features and fabrics as describe above. Various styles of outer layers include Highly Reflective, Windbreakers, Thermal Softshell, High Visibility Jackets, Rain and Snow Jackets, Commuter and Athleisure Jackets, and Packable Jackets and Vests.